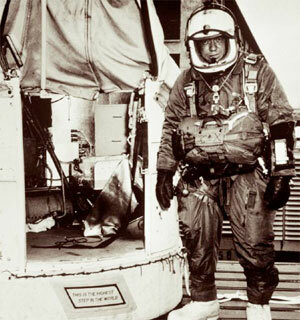 What is the Stratosphere and why did Joe Kittinger fly a helium balloon to it? On August 16th, 1960, Joe Kittinger did the unimaginable. He rode a giant helium balloon to the “edge of space” and jumped out into the Earth’s atmosphere to record the longest ever free fall at 100,000 feet or 31 km. Just hearing about the what happened can bring anxiety to oneself; it is hard to believe that Kittinger willingly agreed to do this. No one had ever attempted to do this before, so he had no idea what would happen or whether or not he would live. He jumped from the stratosphere to the troposphere at 1000 kmph, and it is reported that he felt nothing even though he was nearly traveling at “the speed of sound.” He began to feel the air pushing against his body when he reached the troposphere again, but what some might wonder is how he felt nothing when he was traveling at a rate most people will never experience? This is where one must discover what the stratosphere is and how it is essential to life on Earth. The stratosphere is 16-50 km above the surface of the Earth. The gravitational pull of the Earth is not as strong in the stratosphere as it is in the troposphere which is why it is less dense in the stratosphere. This sphere protects us from the sun’s rays because the ozone layer is located here. The stratosphere protects all life from the harmful rays (UVB and UVC) of the sun without it most life on earth including humans would surely die. At this altitude temperature’s have been recorded to be 3,182 degrees Fahrenheit or 1750 degrees Celsius. It is important to know that Kittinger did not embark on this mission in order to obtain a world record. He did it for science. In 1960 the first person had not yet gone to the moon. There was very little knowledge of atmospheric travel or space travel. Kittinger recalls that he had no idea what was happening to him in the stratosphere because he could not feel anything and he had no idea whether or not he was suspended in space or falling to the troposphere. People like him are the reason that advances in science occur. Although he no longer holds the record for the highest free fall, it is because of him that his record was broken. His journey helped scientists better understand conditions in the different levels of the atmosphere and how to make better technology for the future. He helped daredevil Felix Baumgartner to break his record. Kittinger is quoted saying that “15 minutes before I was at the edge of space, and now I felt like I was in the garden of Eden.” It is incredible how he risked his life in order to help the people of the world understand how “beautiful,” our planet is. I can honestly say that if I was offered to do the same with today’s technology I would be terrified, but knowing that I could help others understand the environment I would do it. It is amazing how far we have come from sending a man into the edge of space using only “tin can” and a helium balloon.